Interested in paintings of koi fish from Japan? Find out about Japanese koi art which revolves around the most popular fish in Japan. Although the koi fish actually belongs to China it is through Japanese art that the species became known on a global scale. The species itself comes in an array of different colors that are very appealing to the eye. For the Japanese people the koi fish is a symbol of good luck and is highly revered. Over the years however the koi fish has served as inspiration for many works of art of various kinds. The Japanese koi fish is a prominent feature in many paintings from Japan. One of the processes which were widely used for the production of koi fish based art is Gyotaku. This was a print making process that actually made use of real koi fish! The word Gyotaku which is the name of the process actually means fish rubbing. In truth it is all about capturing a koi fish in a particular motion or direction and then making impressions of the fish that has been painted. The Gyoktaku is pretty much like the process of block printing with the addition of the use of the real live fish. 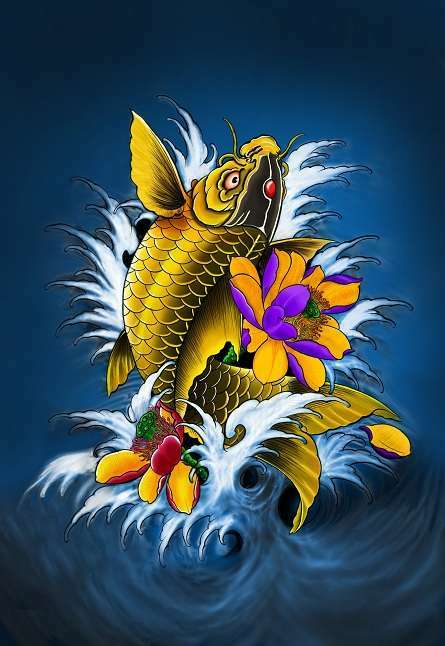 Koi fish art can be traced back to the middle of the 1800s in Japan. It was the Japanese fishermen who started to create impressions of the Koi fish in order to record their remarkable catches. With the passage of time the commoners discovered the artistic worth of the process discovered by the fishermen. Soon after koi art began to flourish but it is the fishermen who are credited with the discovery of the art form whereas it is the commoners who made it commercial. Creating Japanese koi fish art through the traditional procedures is quite challenging. Not only is fresh koi fish hard to locate rather they are quite expensive as well. If you were to draw a comparison then Japanese koi fish art can be compared to the practice of mounting the fish by the American fishermen. There was a fundamental difference between the Japanese trend and that of the Americans. This was the fact that the koi fish could actually be eaten once it underwent the Gyotaku process. There are fishing competitions in Japan that are judged according to the imprints derived through the process of Gyotaku. In recent years we find that the Japanese koi fish art has been exported beyond the boundaries of Japan. This strange form of art has been explored by people from all around the world belonging to different schools of art. For most first timers the process of Gyotaku can be quite exhilarating. Mastering the art of Gyotaku can take a lot of time because the challenges faced by a novice can be quite overwhelming. Today however you will be able find specially designed rubber koi fish that have been developed for the purpose of print making. Although this has evoked some criticism from the purest koi fish artists it has certainly made things easier for those willing to try their hand at this form of art.